I’m really thrilled because Heartless wasn’t my favourite. I didn’t hate it, but I didn’t love it either. But Renegades??? YES! AWESOME! The world building – It was very X-Men-esque. It was described very well and I feel like I got a good grasp of the history without it being too overwhelming. How we got to see two different sides – the Renegades and the Anarchists. They’re painted as “good” and “evil”. But I love how the book really blurs the lines and you start to wonder if the Renegades are really good and if the Anarchists are really evil. It becomes very clear that both groups have both good and evil in them (or at least good intentions that end up having bad results). The main character, Nova – Nova is kind of a villain and it was awesome to read from her point of view. This largely ties into the previous point because she starts to see a different side to her enemies. I also loved how she didn’t use her powers as a crutch and she really believed people could be heroes without them. The whole book was fast-paced and interesting – It’s a LONG book (over 500 pages), but it was never boring. Something was always happening and every part of the book felt important. The ending – WHAT WHAT WHAT!? I totally didn’t see it coming, even if it seemed obvious in hindsight. I’m so pumped for the next book!! The action, pacing, and good vs evil aspects of Renegades definitely had some similarities to The Lunar Chronicles. The stories are very different, but there’s a similar vibe and I think you can really tell they’re by the same author. 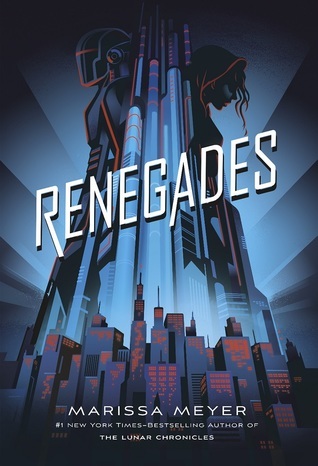 If you love that series then Renegades is definitely worth a read! Yeah, I didn’t see that ending coming either. I liked the story and felt it had a strong plot, but the lines being crossed were a bit thin. One minute she was easy to read and complicated the next. But I guess that’s what love does to you. LOL Though I enjoyed the story, I’m not sure if I’ll be reading the next book. Sorry to hear you didn’t enjoy it enough to continue the series. It’s a bummer when that happens! How did I miss another Marissa Meyer series starting?! I loved Lunar Chronicles, and actually loved Heartless too – so I’m excited for this, glad you put it on my radar 🙂 Great review! I loved this too and I can’t wait for the next book. I had a feeling the story was leading up to how it the ended but I was still surprised. I also loved it. The blurred lines between heroes and villains are so interesting.